Enterprise Eggs™ is our answer to sharing our Python, Zope and Plone software with all of the operating system platforms that do not support RPM. BastionLinux™ uses RPM to one-click deploy our software to any x86_63 Linux platform. We support all of the commercial Linux distro's for organisations that would prefer a larger vendor to manage their OS Service Level Agreement. However, there is a wide commercial segment which does not use RPM-Linux and we do not wish to preclude them from enjoying the benefits of the considerable investment we've put into our Enterprise Zope and Plone release management. Our answer to this dilemma is to make our software channels pypi-aware and to ship eggs along with RPM's. 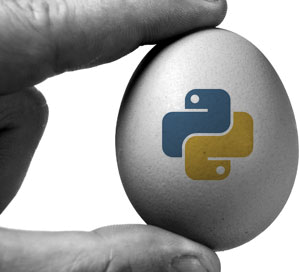 Our eggs are all built from the corresponding RPM package - it's just they only have the Python component and lack all of the non-Python effects RPM release management offers. So, if you're running Windows, OSX, AIX, Solaris, HP-UX - or anything else for which you've got Python, you can run our software! In a production environment we still strongly recommend deploying on BastionLinux™, but if you're doing a proof of concept, pilot, or something else that doesn't need to be so featureful or robust then this is an option for you. Our Enterprise software often requires access to our ISP-strength platforms - email gateways, single sign-on, clustering, caching, load-balancing for example. These features are all missing from eggs. We also ship data files in separate packages which would need to be manually loaded - such things as shockwave files for Flash libraries, currency and country codes, and the like. You should be prepared to perform some system administration on egg-only downloads as we cannot make this transparent as we do with BastionLinux™. We are of course, fairly expert in the shortcomings of these eggs, and can provide you all the necessary assistance and support. But the best feature of starting with eggs is that you've already purchased your BastionLinux™ subscription and we will allow you to migrate this licence to your new server whenever you choose to upgrade to Enterprise Linux.